OKLAHOMA CITY (AP) — Oscar Robertson endorsed Russell Westbrook for the Most Valuable Player award before the Thunder’s regular-season finale against the Denver Nuggets on Wednesday night. Westbrook broke Robertson’s single-season record for triple-doubles by getting his 42nd on Sunday against Denver. Robertson set the previous record of 41 for the Cincinnati Royals during the 1961-62 season. 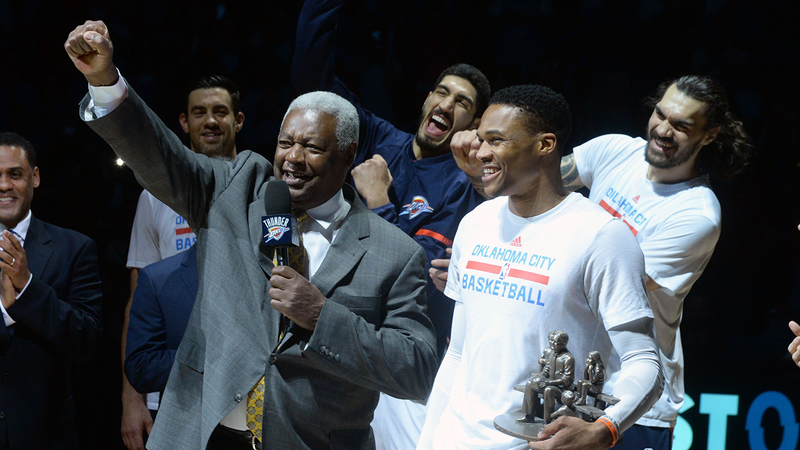 Robertson attended Wednesday’s game as part of the Thunder’s effort to honor Westbrook for his record-setting season. Robertson congratulated Westbrook, and at the end of his short speech, he got the crowd fired up. “I only have one more thing to say: M-V-P! !” Robertson said, triggering a loud ovation. Westbrook broke Robertson’s triple-double mark with a 50-point, 16-rebound, 10-assist performance in Denver on Sunday, and his buzzer-beating, game-winning 3-pointer knocked the Nuggets out of the playoffs. Robertson said Thunder fans should be proud of Westbrook, the first player since Robertson to average a triple-double for a season. “When Russell was on this journey, I felt that I just had to be here,” Robertson told the crowd. During the pregame ceremony, the team stood at midcourt with Westbrook, along with owner Clay Bennett, general manager Sam Presti, coach Billy Donovan and assistant general manager Troy Weaver. Robertson received loud, long ovations when he first took the floor and right before he spoke.